I made this model marine steam engine around 1985/87 based upon the Edgar T. Westbury design for his 'Diagonal Paddle Engine' as published in the' Model Engineer' magazine of circa 1956. Business wasn't too busy in the mid 1980's so I had the crazy idea to make a batch of five! A first class design with lots of atmosphere without too much endless detail. But 'model engineer' detail can be a curse, it took years to shake-off and as per factory toolmaking and design in general needs to be as simple as possible. 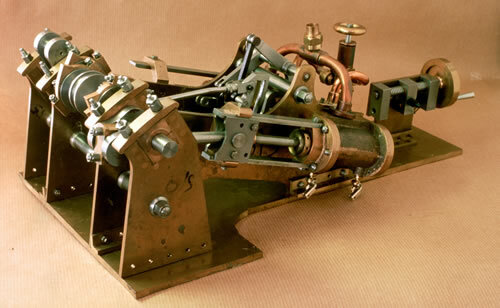 The diagonal paddle engine as illustrated here in its uncompleted form incorporates several constructional changes, I cannot help but 'improve' ... I was 'taught to think' at Hardys by my boss Raymond, a first rate training. The main mod being frames of 1/8 inch brass sheet thereby providing me with an accurate and flat datum to build the engines up from, no way could I work from the aluminium frames as supplied by the castings people and anyway aluminium is so incongruous with anything 'steam'. I suppose that is the toolmaker in me, again its my training. But coming from a model engineering background was also a handicap, the curse of incorporating needless detail and endless complication. All motion pins in this version are hardened and tempered silver steel, but with hindsight I would have used case hardened mild steel. I am pleased with the eccentric rods, which look very 'dainty' and I also made an effort to make a better looking bearing keep than is usually fitted. I'm very keen on fitting the appropriate studding and nuts as would be typical full size practice, I doubt you'll ever see slotted screws in any of my model engineering projects. I even made the recommended silver steel three bladed milling cutter to machine all three cylinder ports in one go as per the front page of M.E. in the late 50's. I found illustrations of these eighteenth century bow drills and associated ratchet/ bow handles in Bergeronâ€™s 'Manuel du Tourner' of 1816. I'd been suggested this book; when I was about fifteen years old along with about a dozen other titles by the man I was intending to serve my apprenticeship with, I never got to start the apprenticeship with him, probably just as well as time proved that he was not serious about taking me on, not a very nice man actually. However the reading list was invaluable, such gems as George Sturt and Holtzapffelâ€™s five volume 'Turning and Mechanical Manipulation', long before the low cost reprints became available. However with Holtz be careful, theres also patent gizmos included that never stood the test of time, yet admittedly their OT equipment ticked all boxes and most sections of the five volumes stand perfectly the test of time. In the photograph I've forgotten to include the steel bows which fit into the ratchet handles, I forged these myself from old lorry axle spring, all this when I was about twenty years old - I must have been very keen/ madly keen! The ratchet wheels were made by me, at the time I was exploring ways of making clock wheels and pinions therefore used any excuse to cut a toothed wheel. You will see that one thumbscrew is English pattern, the other is French. The handles are the same material as I used for the shoulder plane infill, an excellent piece of rosewood kindly given to me by a work colleague at Hardys, Frank in Development. And if you find one of these knocking around its never been paid for and needs to be returned, I naively allowed one to be taken away out of my sight. Books n tools - never lend 'em !! http://richardkell.livejournal.com - my workshop blog.